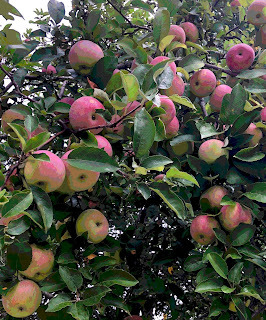 Here's a closeup, cropped from another recent photo of the neighborhood apple tree. Another candidate for a Rosh Hashanah greeting. Yesterday's post was a recent photo of a neighborhood apple tree. 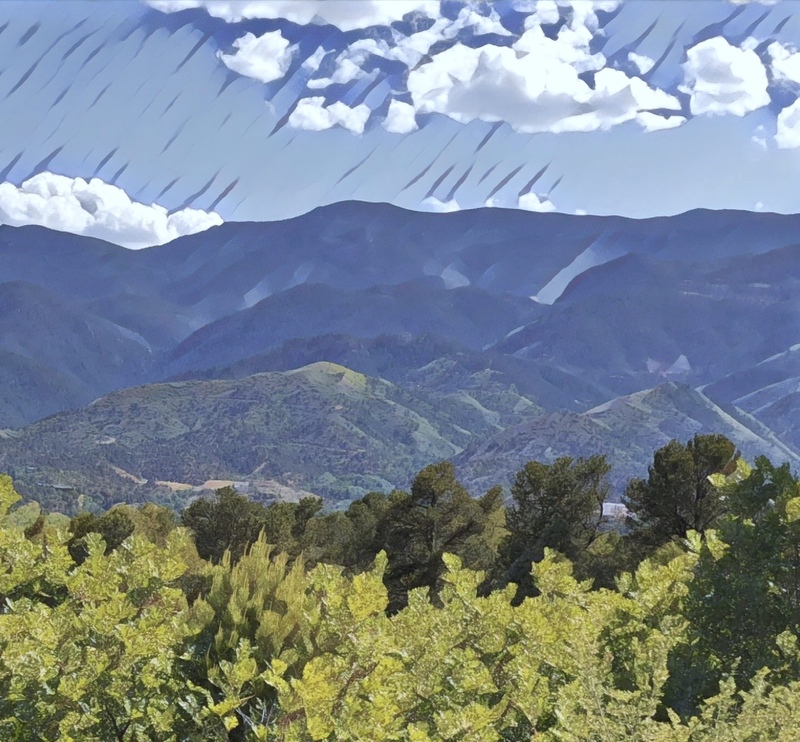 Today's image is a posterized version of the photo, created in Painter. The posterizing effect emphasizes shapes and colors. I think this image might make a nice Rosh Hashanah greeting. Earlier this week, I posted pictures that I took in July of an apple tree in our neighborhood. I have never seen it so full of apples! Neighborhood walks often take it right past it, and it is even more amazing than it was in July. Here is a picture that I took on August 23. Tonight I cropped the original image to get this composition. I also made a posterized version in Painter which I hope to post here tomorrow. Yesterday's post was a rescued family snapshot of my father and my Aunt Gertie, taken in 1938. 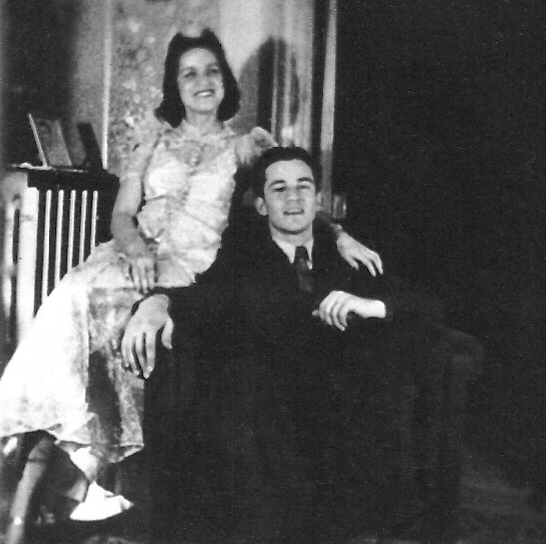 I was looking for a photo to post today because my father was born on August 28, 1918, one hundred years ago! Today's post is the same photo, but I used Painter to add color to make it celebratory. The original was a 2" x 3" snapshot in a collection of other photos sent to me by my Aunt Celia, via my cousin Bob Fitterman. I received the photos a few years after my father died. These were all photos of my father before he met my mother. Most of the pictures were brand new to me and it was great to get them. My father was one of seven children: his brother Barney and five sisters, Celia, Lena, Matilda, Gertie, and Rita. Both Gertie (in the photo) and Matilda died this year, so now all the siblings have passed away. Well, I always felt to be part of such a big family on my father's side, and especially fortunate to be my father's daughter. My father was born on August 28, 1918, so tomorrow would have been his 100th birthday! He died at 75, seems like a long time ago, but I still miss my dad! A few years after he died, my Aunt Celia gave me a bunch of photos of him as a young man, photos I had never seen. This morning I was looking through those photos and found this one. My Aunt Celia had written on the back, "Hy and Gertie 1938". 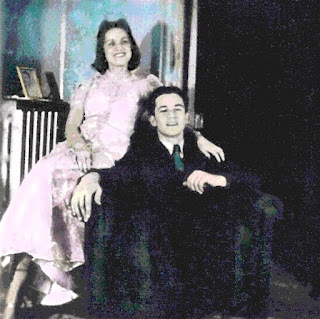 I love this photo and thought it would be an especially good choice because my Aunt Gertie passed away this year. She was lovely, as you can see in this photo. (My father had one brother, Barney, and five sisters: Celia, Lena, Matilda, Gertie, and Rita, all of them beautiful!.) After I chose this snapshot (about 2" by 3"), I scanned it into the computer and then did some basic cropping and retouching in iPhoto. Then I opened the image in Painter and had some fun adding color. I plan to post that version tomorrow, in celebration of his birthday. And then I plan to have an ice cream, in his honor. Yesterday I posted a photo of apples on a tree. I took the photo in July during a family walk in our neighborhood. 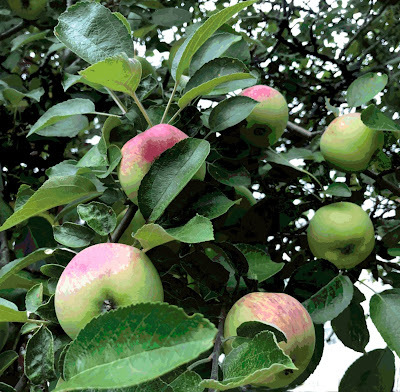 The branches of the apple tree were hanging down over the sidewalk, so I came face to face with apples. Of course I took some pictures, Tonight I cropped the original photo and used Painter to add some selective posterizing and woodcut effects. I also simplified the background a bit with digital pastel. 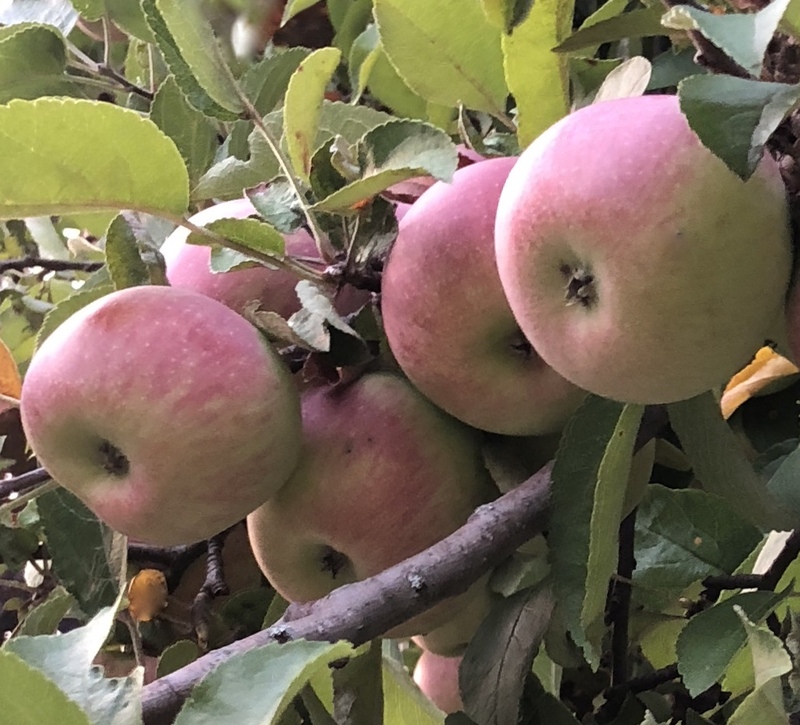 In July, during a neighborhood walk with family, I came face-to-face with these apples. 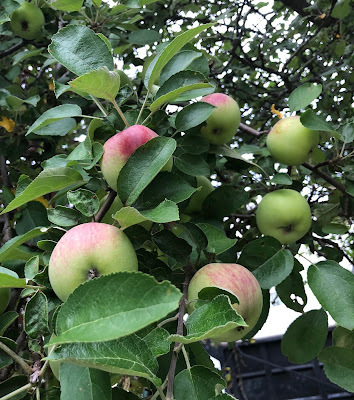 I have never seen an apple tree so heavily laden and its branches were hanging down over the sidewalk, so I took some pictures. Tonight I cropped the best of the set. 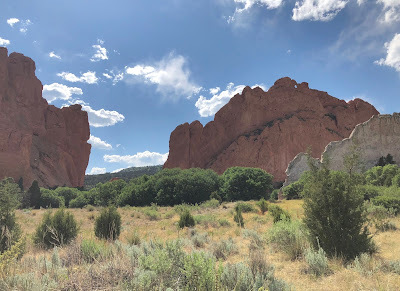 Several days ago, I posted a picture that I took this summer (back on June 9th), during an excursion to Garden of the Gods in Colorado Springs. Today I used the Prisma app on my phone to add a filter. (For this group of photos, I have been using the "Gothic" filter, but I take it down to about 75 to 80 percent, so it no longer looks Gothic, just a bit rugged, which is what I am after. I made this necklace this morning. I started with the aqua stone beads I used yesterday and added dark wooden beads in two shapes, round silver beads, and silver plated beads in two designs. This is strung on a black cotton cord, long enough so no clasp is needed. I made this necklace this morning. The design came together pretty quickly. I started with the blue beads. (They look like turquoise but the label says "dyed aqua reconstitued stone".) I tried one of the aqua beads next to a sage green wooden bead, and then added a copper-colored seed bead. 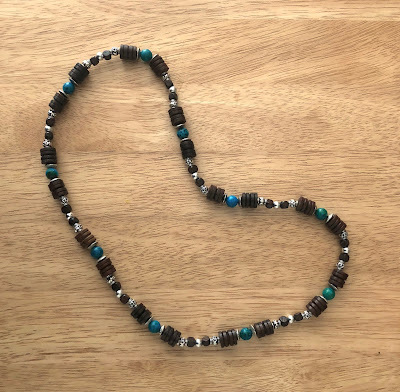 I really liked the combination, so I finished the design with cream-colored wooden beads. This is strung on black cotton cord, long enough so that no clasp is needed. I have been working on this necklace for several days and finally finished it this morning. 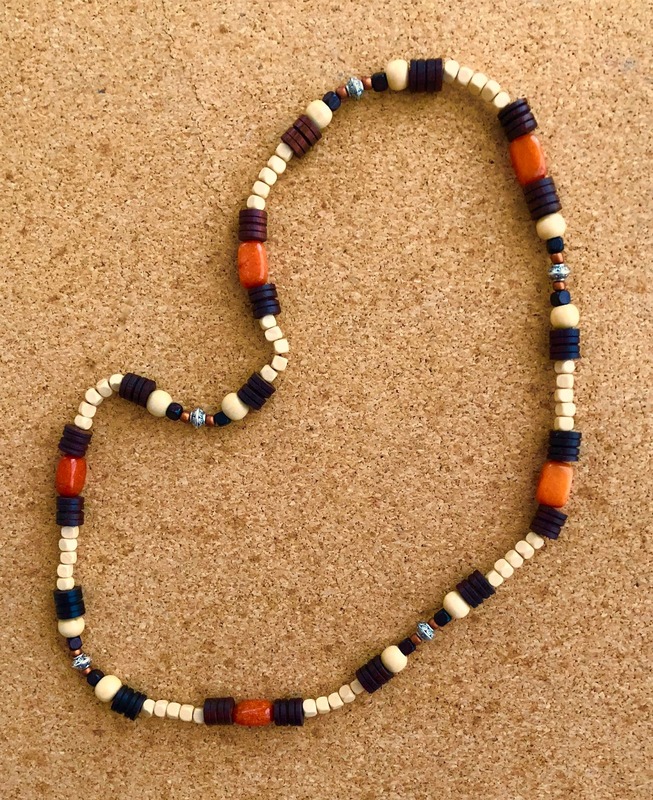 It is orange aventurine with wooden beads, accented with metallic beads in silver and copper. The beads are strung on a black cotton cord, and is long enough so that no clasp is needed. 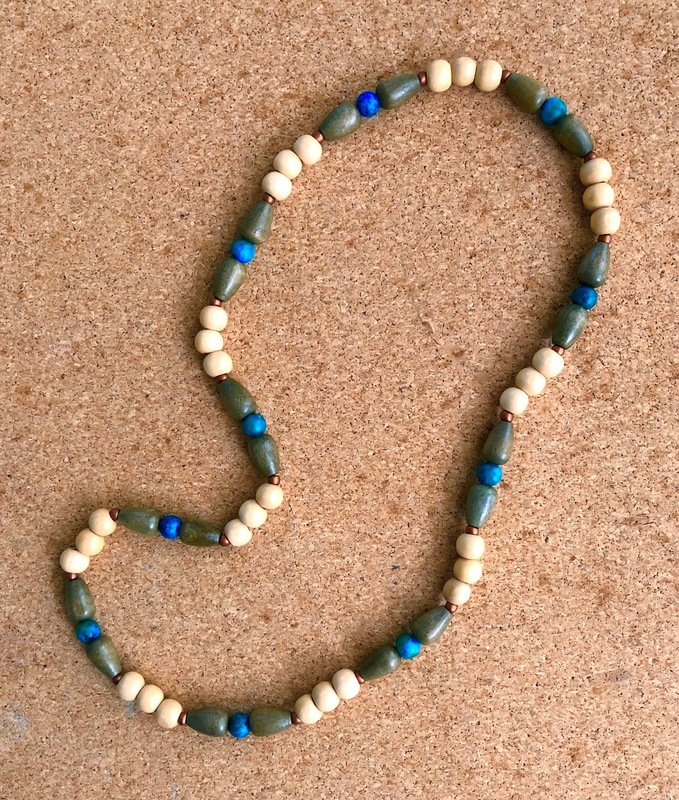 Combining semiprecious stones with wooden beads makes for a necklace that is light and comfortable to wear. 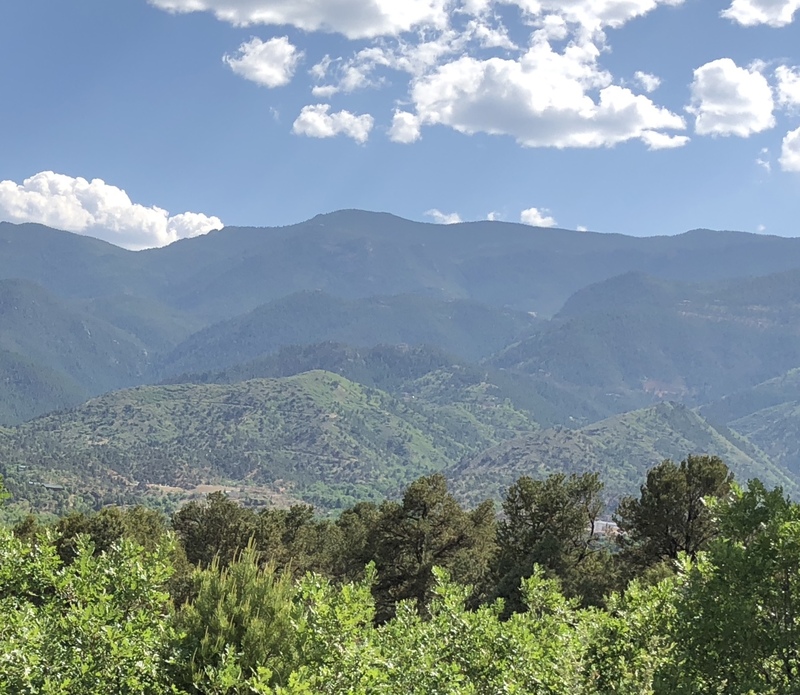 A couple of days ago, I posted a photo that I took in June, a view of the mountains seen from Garden of the Gods in Colorado Springs. Here is the same photo with a Prisma filter added. I am still editing photos from our Colorado trip in June. We went back home to meet up with Sandra and Rene, friends from Brazil who we met in 1968 at the University of Colorado. One day we drove to Colorado Springs to visit our friends Herman and Kerry and we all went to see Garden of the Gods. I took lots of pictures. I like this one because of the odd shapes but even more because of the color scheme: dusty rose rocks, sage green brush, bright blue sky. Today I cropped the original photo to get this composition. So much happened this summer and I am still trying to catch up! In June, we flew to Colorado in June to meet up with our friends Sandra and Rene from Brazil. We met them in 1968 at the University of Colorado, in married student housing. To celebrate 50 years of friendship, we spent a week touring Colorado. One of the highlights of our trip was taking Sandra and Rene to Colorado Springs to meet our friends Herman and Kerry. After a wonderful lunch, all six of us piled into the car to see the Garden of the Gods. Don't worry, I took lots of pictures of the amazing rock formations there, but I couldn't resist taking this quieter picture of the mountains as well. Tonight I straightened and cropped the original image to get this composition. I also used the Prisma app to add a filter, and I plan to post that version tomorrow. I tried some Prisma filters with the photo I posted here yesterday. This is the one Iike best. The original photo was taken in June as we were driving back to Denver from Central City. I am still catching up with editing photos from Colorado. 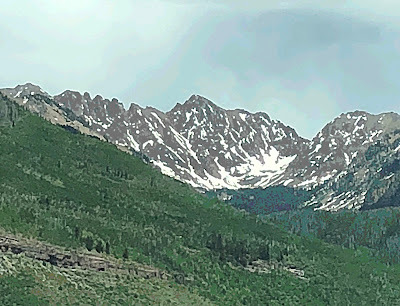 I took this one back on June 11, as we were heading back to Denver from Central City. What I like about this photo is the way it shows the layers of mountains in the distance. This is the original photo, no editing. Tonight I tried the same photo with some Prisma filters, and I plan to post some of those over the next few days. I started this little drawing yesterday, using Sharpie fine line markers on paper (6" x 6"). Today I opened the image in Painter to do some cleanup with digital pastel. 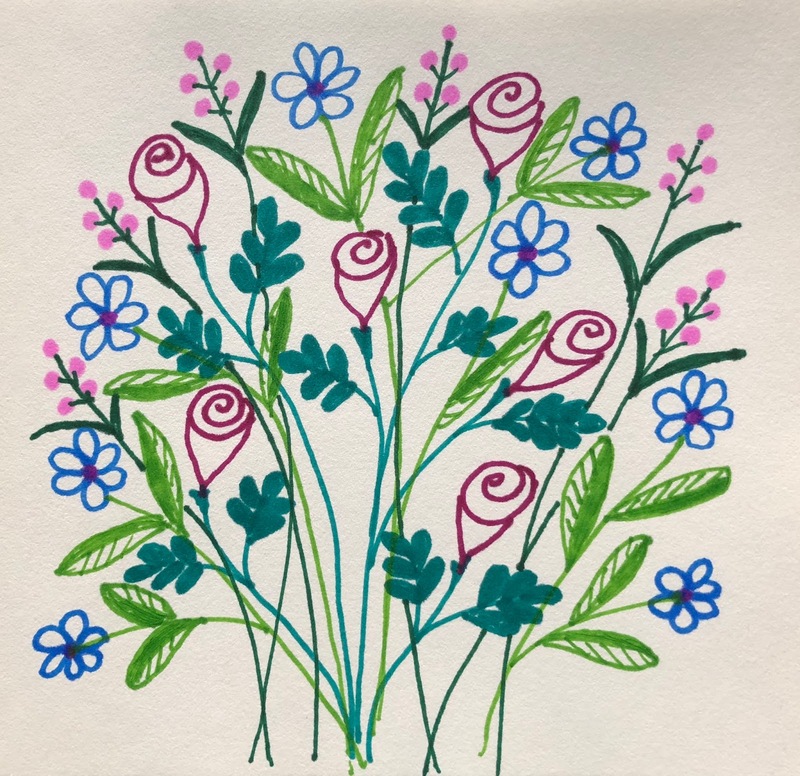 I also added some magenta to the inside of the flowers. That would not have been possible otherwise, because with Sharpies you can only go darker, never lighter. This isn't perfect, but I managed to get rid of most of the problems that were really distracting. This image started as a photo that I took in Colorado back in June. It was around 6:30 pm. We had driven to Colorado Springs and were heading back up to Denver. I liked the look of the sky behind the mountains so I took some pictures from the car. Tonight I cropped out the car, the road, the telephone poles, etc. to get this composition. By then, the focus was too soft to use, so I opened the image in Painter, posterized the image, and sharpened the focus. I like this as it is, but might use it as a reference for a painting. 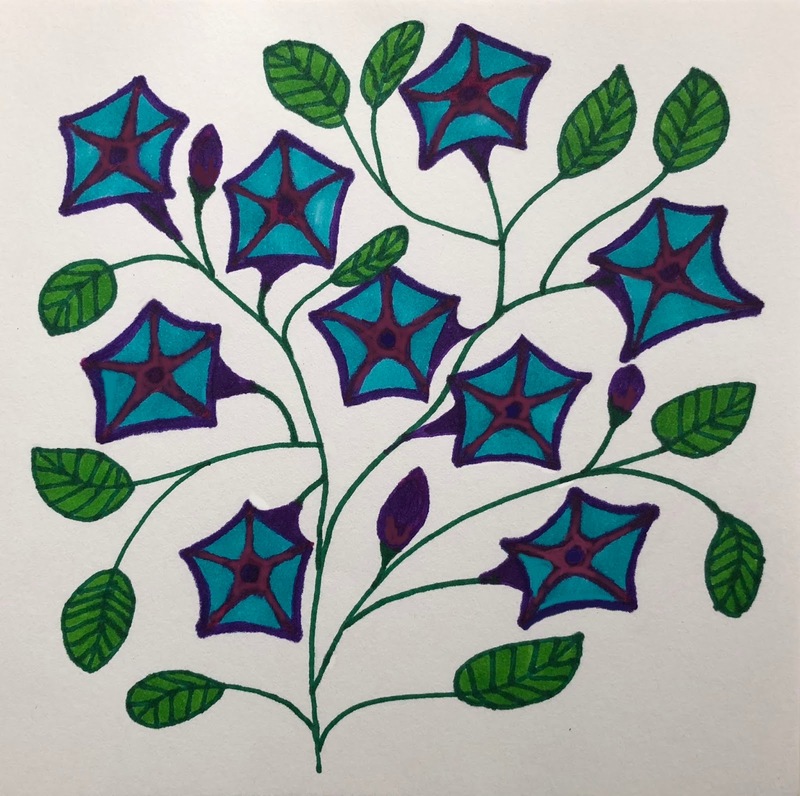 I started this drawing yesterday, using Sharpie fine-line markers on paper (about 4 x 4 inches). I was going to add to the drawing but decided I wanted to keep it simple. So today I finished it up on the computer. I used Painter to get the flowers centered on the background, and then cleaned it up with digital pastel, just fixing any mistakes that I thought would be distracting. I have been very, very busy this week, but today I finally had a chance to draw. All the things that keep me so very busy are the very things that I am grateful to have in my life: family, friends, work. I am also grateful that I can draw, and drawing is the best way to express gratitude for that. 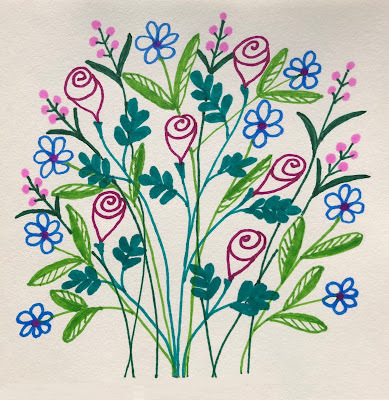 So today I drew these flowers, using fine-line markers (Sharpies) on a small piece of paper. I am grateful for flowers because they are beautiful and because it always makes me smile to draw them. I think this drawing needs a little more work , but I hope to finish it tomorrow. Another image from our Colorado adventure. 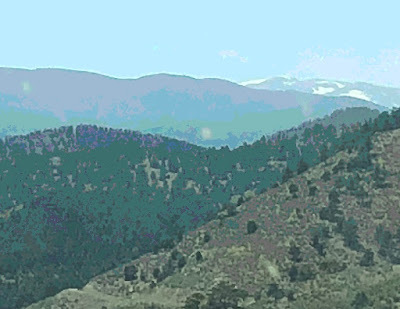 I like the view as you drive west to go to into the mountains. 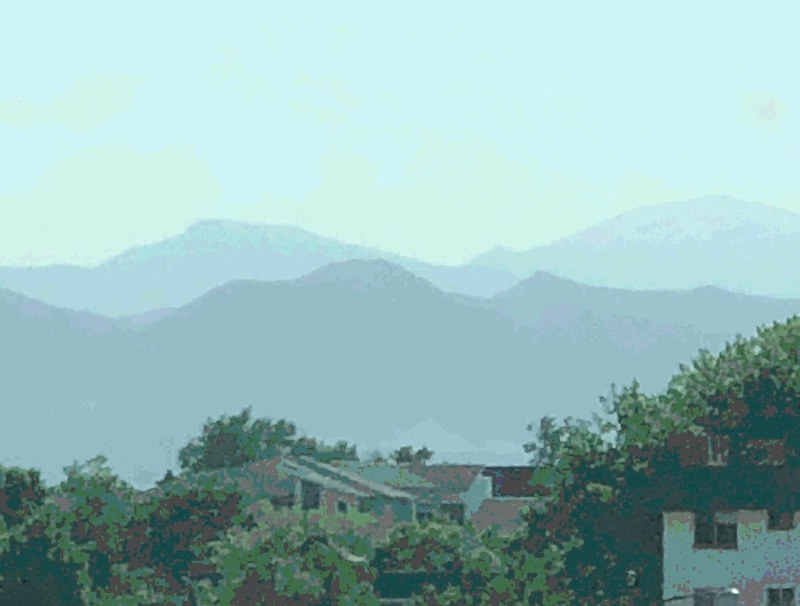 Although are still in the city, those mountains are right there! 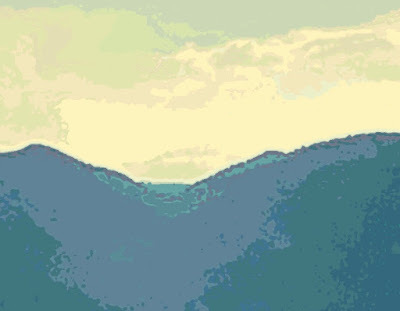 I cropped this image from a photograph that I took from the car. By the time I isolated the composition I wanted, the image was getting blurry. So I opened it in Painter and added some posterizing effect. I am having fun editing some of the photos I took during our Colorado trip in June. This image began with a photo that I took on the way to Central City. I remembered the excitement of going to Central City as a kid, Unfortunately, it was Monday and the Opera House and Saloon were closed. Everything was quiet except for the casinos. But the drive to get there was very exciting, lots of twists and turns, and great views of the mountains. I was taking pictures from the passenger seat as we drove. By the time I cropped the car interior and street signs out of the original photo, the focus was very soft, so I opened the image in Painter and began to play with it, posterizing in sections to get interesting colors. In June, we spent a week in Colorado, traveling with our friends from Brazil. (We met 50 years ago at the University of Colorado, two newlywed couples in married student housing.) We have been friends all these years and we had a great time. 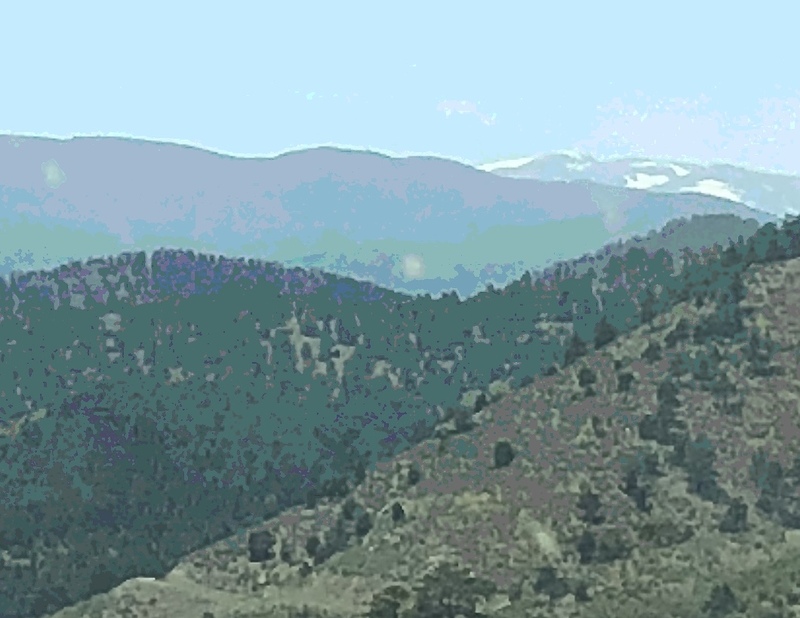 I don't often get a chance to see the Colorado mountains, so I was taking pictures all the way. I took this one the day we went to Breckenridge. The view of the snow above the tree line was amazing. Tonight I edited the original photo to get this image, cropping out the inside of the car, the highway, trucks and cars, and signs. When I was done cropping, I liked the composition but it was too blurry so I opened in in Painter and fiddled with it, adjusting the focus and then posterizing by sections. Here is another image from my recent trip to Colorado. 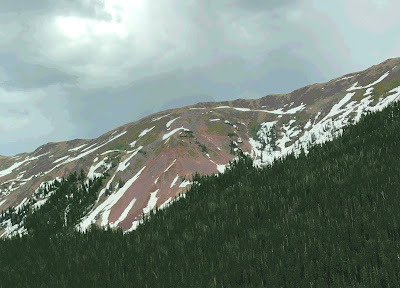 I believe this is from the to Breckenridge. Even in June, there was snow above the tree-line. I took the original photo from the passenger seat of a moving car. Today I cropped this image out of the original photo. Yesterday I posted the photo that inspired a recent painting: a bit of sun shining on a dark green mountain. I took the photo during my recent trip to Colorado. 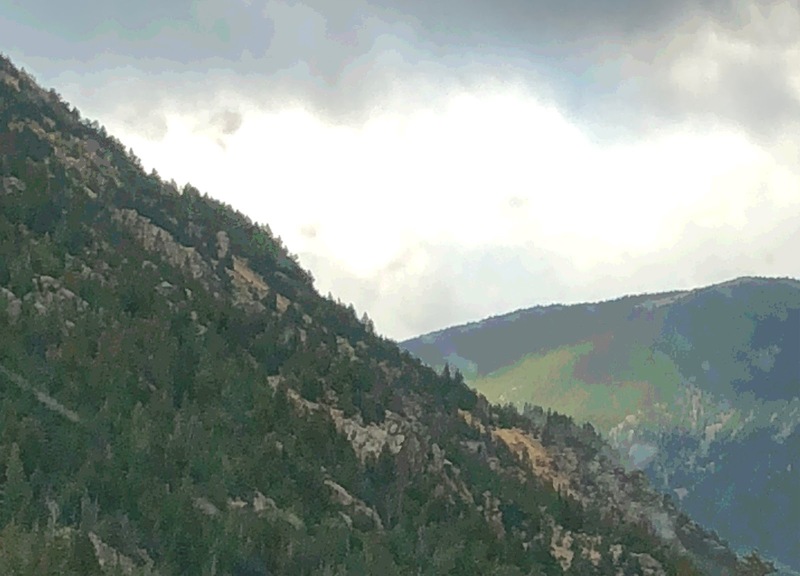 We were driving from Vail to Denver and I saw that sunlit mountain. Today I used Painter to add posterizing effect.